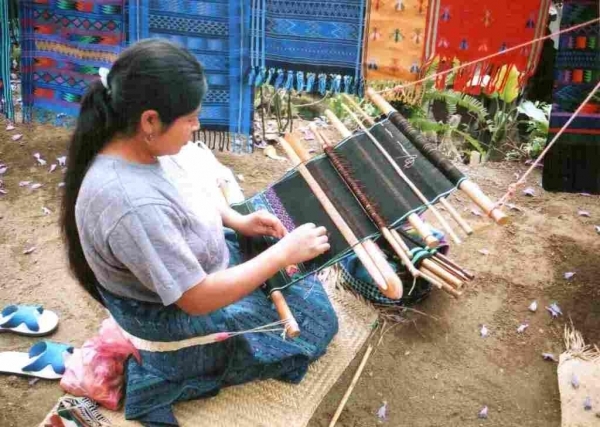 I have written posts about all those mysterious sticks and wooden implements, from the basic loom bars to the heddle sticks, shed rods, coil rods, stabilizing rods, shuttles, beaters, swords, pick-up sticks, even “poking sticks” (my own name for an implement my Guatemalan teachers used to create inlaid brocade). Last weekend I went to the highlands to the city of Cochabamba to experience the ultimate in “stickless” weaving – what I named “barefoot weaving” in a previous post and am now able to add yet another handy dandy tool to my backstrap weaving kit….my humble big toe! I used to have rather fierce-looking, blister-proof ready-for-anything feet in my old trekking days. They carried me up and down mountains in many places across the globe but I am ashamed to say that they have now gone “soft” on me even though I rarely wear shoes in this climate that I find myself in. 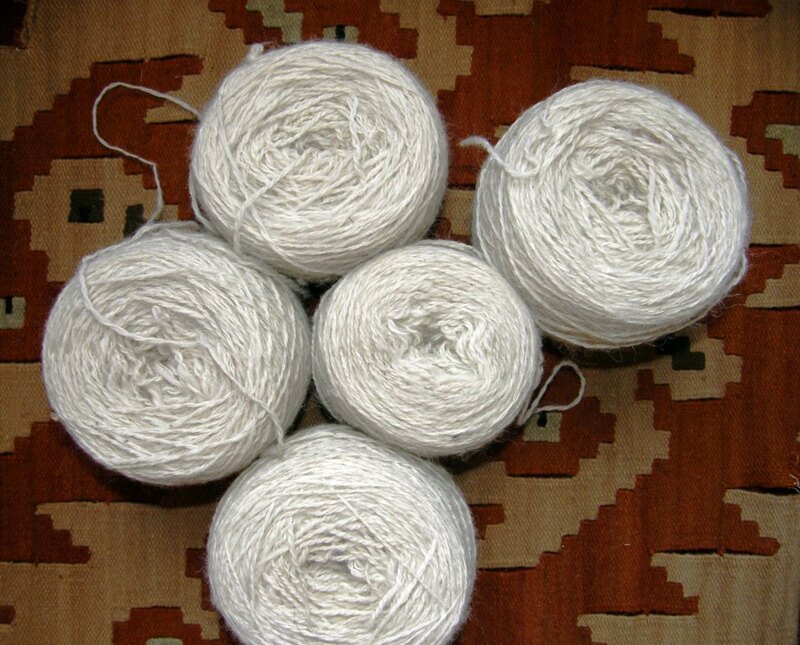 So, I didn’t last long with the hard-spun coarse wool chafing my toes and I shall have to put them into training for barefoot weaving. Maxima, daughter Zoraida and granddaughter Zuni were my weaving companions for my three-day stay in Cochabamba. Maxima was my teacher while little Zuni played at spinning on her "pushka". Zoraida was making a hat for daughter Zuni in tapestry crochet. I met Maxima at the Tinkuy de Tejedores in Urubamba, Peru last year. She was my roommate along with American ex-Peace Corps worker Dorinda Dutcher. Dorinda, who lives and works with the weavers in the town of Independencia here in Bolivia, had raised funds which had enabled her to take Maxima to the event. You can read about Dorinda’s work and her PAZA foundation here. Dorinda, Maxima, Zoraida and Zuni were in the city last weekend selling weavings from their cooperative at a handcraft fair and this was a great opportunity for me to make a quick visit and have some classes. The fair included all manner of handcrafted items as well as grains, and medicinal plants of the famous Kallawaya healers of Charazani. 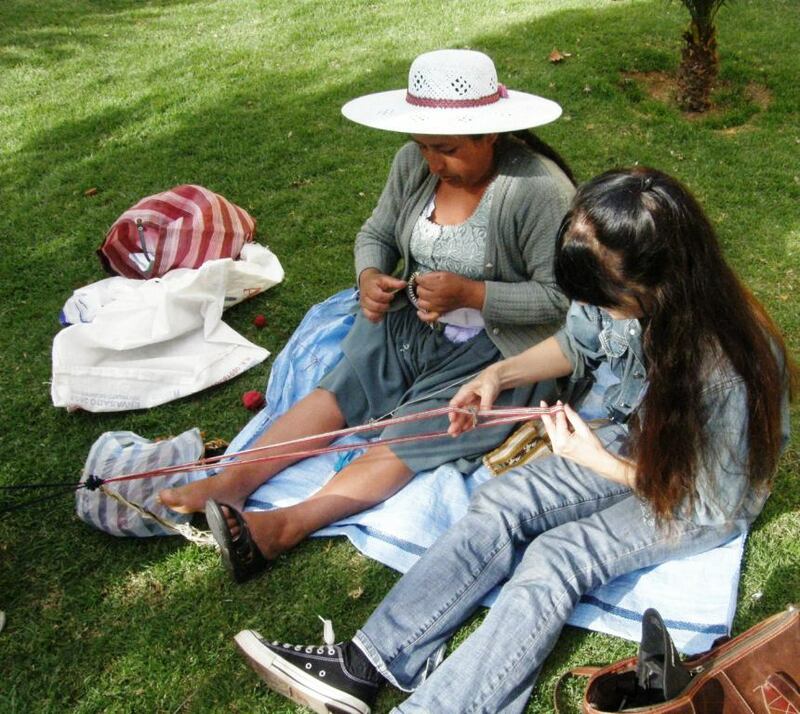 The weavers are recovering the art of dyeing their handspun wool with natural substances and creating large and small bags, pillow covers, hair bands, belts and other woven items which they sell at three such craft fairs that are held in Cochabamba each year. I was excited to be able to buy almost a kilo of handspun and plied alpaca yarn from a neighboring booth at a very nice price . As it has been spun for knitting, I will need to respin it for warp-faced weaving on my backstrap loom. I hope to be able to dye a lot of it too. I spent the mornings walking around the city on this my first ever visit to Cochabamba. I went up the hill to see the Christ the Redeemer statue which is just that little bit higher than the more famous one in Rio de Janeiro. Although the location is not quite as exotic as Rio, there was a nice view of the city in its pleasant valley surrounded by mountains. That left the afternoons for weaving classes. Our only tools were our fingers and toes, scissors (am I the only one who uses her teeth when no one is looking?!) and a needle for sewing the tubular bands or bordes that we made. Here are the lovely yarns we got to play with…handspun and dyed with natural substances. A few of the colors were not ready to weave with yet as they had only been lightly plied and so Maxima picked up her large plying spindle and gave the yarn the extra twist needed for weaving. I have some nice video of Maxima doing this seated on the ground using that typical sweeping motion between her two hands to set the spindle in motion. I will show the videos in a future post once I have edited them. You can see the very high amount of twist in this yarn. The bands, when not under tension, will spiral and the unwoven yarn curls up on itself in an alarming mass. Above left, Maxima is twisting the yarn and on the right she has started warping for a tubular band using her forefinger and big toe as her warping stakes. As she does not have two central stakes around which to separate her colors, she winds her two colors together as doubled strands and then rearranges the cross once she is done. She tucks one end of the warp into the waist band of her skirt while the other ends stays wrapped around her toe. 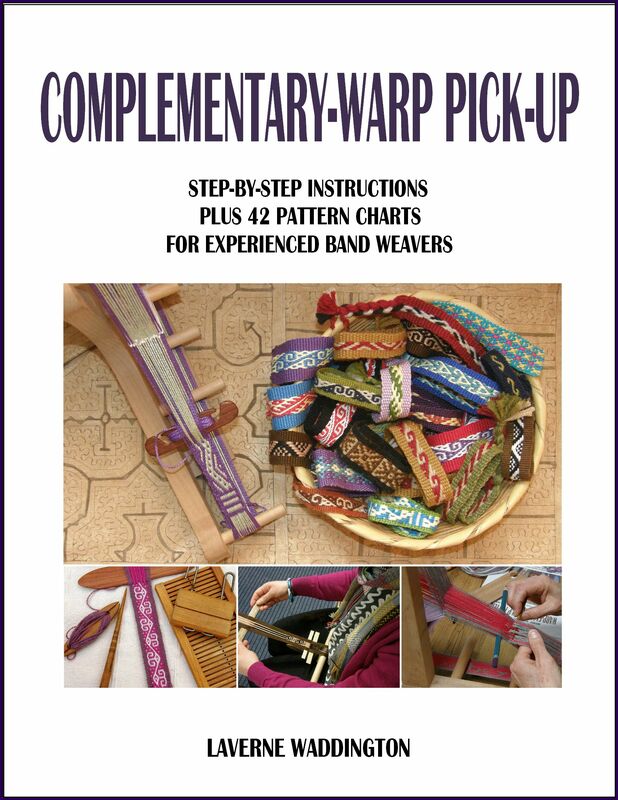 This leaves her two hands free to rearrange the warps into their two sheds. Maxima then secured one side of the cross in a shed loop and made simple string heddles around the warps on the other side. Once the set up was complete, she removed the warp from her waistband and tensioned it between her forefinger and her toe…no backstrap or waist string was used. On the first afternoon, I asked to learn tubular bands. I was so absorbed with filming, photographing and noting everything down that I didn't realize that the first band she taught me was actually pebble weave! Her set up and way of doing the pick-up is so completely different to the way I had been taught in the western part Peru. It threw me off at first and I got really confused! 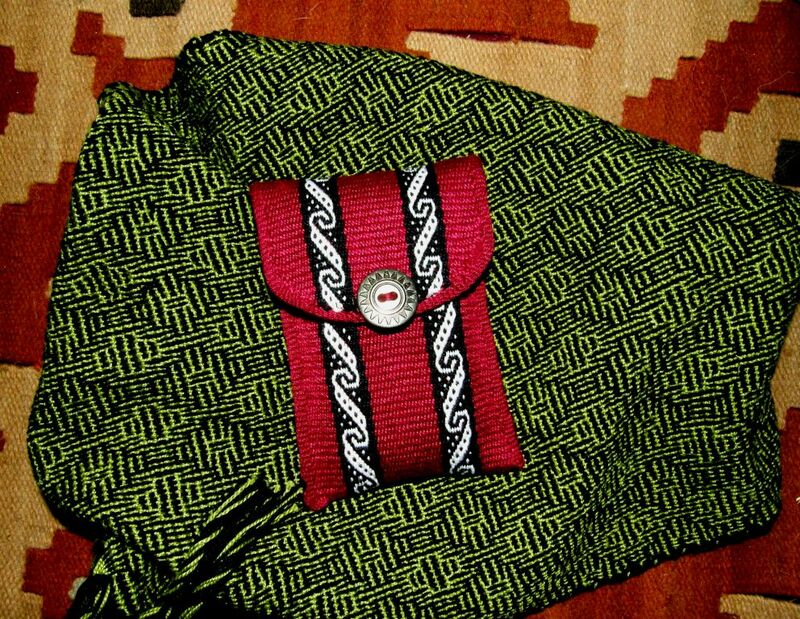 Fortunately we started with the design which is known in the Cusco area as "mayo k'enko" and which Maxima calls "linquito" and so it wasn't all totally foreign to me and I was then able to pick it up quite quickly. Maxima's method definitely has its advantages for weaving pebble weave as a finger-tensioned tubular band. You can see the first pebble weave edging we made in the picture above left. The yarn was way too chunky for the little bag we were edging but it served as a learning exercise. Then we made a much simpler style for the second project. 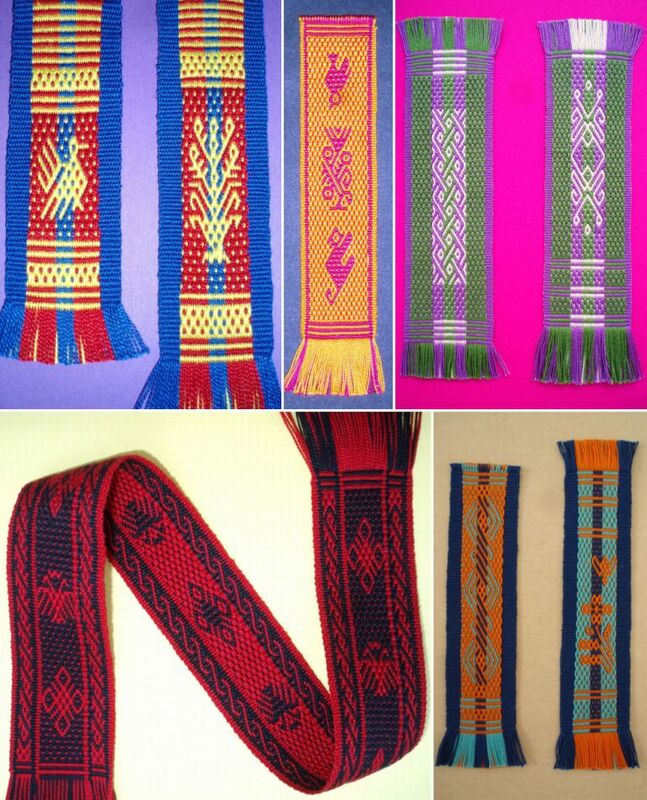 Above right you can see the three pebble weave bands, or huatos, on which we worked on the second and third days of classes, starting narrow and gradually working up to wider designs. Weaving together on the grassy area behind the market stalls was cool and peaceful. Last Saturday was my birthday and this was a lovely way to spend it. There is a reason why these sensible ladies always wear hats. My poor lips are now a swollen mass of blisters from the dryness and high altitude sun. While Maxima finishes off my edged pouch, I am weaving the first narrow pebble weave band. You can see how Maxima taught me to use my two fingers in the warp as my “picking cross” (I explained a little about the picking cross in last week’s post). Maxima has made a picking cross and is selecting the warps from each side of the cross for her design. Her warp is attached to her toe and for a while so was mine. Then I also attached my warp to her toe when mine had had enough! Finally we moved to the post to tie my warp up and later Maxima did likewise. On the left Maxima is using her fingers as cross sticks to rearrange the warp cross. I took my bands back to my hostel to do my homework...yes, there was homework! My bed had a convenient bar to which I could tie up and there would always be my toe if I hadn't been able to find anything that would do. 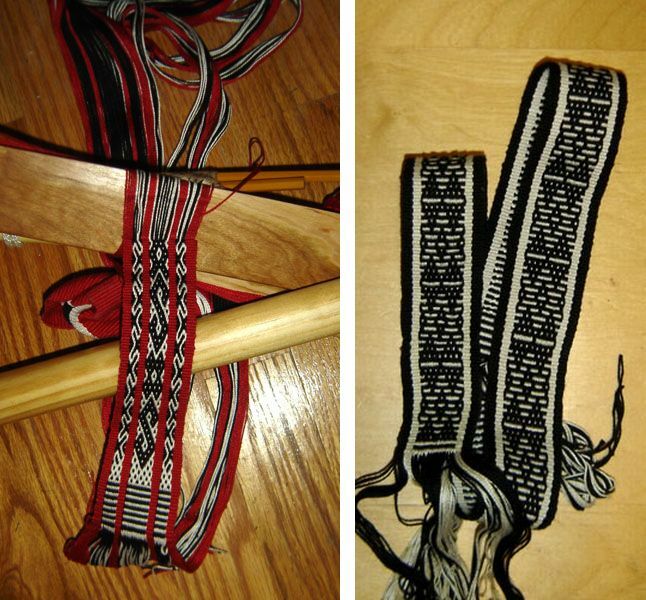 On the third day we worked on wider motifs on the band pictured on the right. Some of the motifs were completely new to me and fun to learn with this "new" way of doing the pick-up. 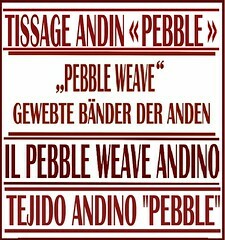 In my Andean Pebble Weave book I show how I was taught to create a border for pebble weave of the same thickness as the design area. Maxima also creates a thick border but in a completely different manner. This is the fourth way that I have seen pebble weave being woven…all so VERY interesting! Maxima with the Club de Chicas. 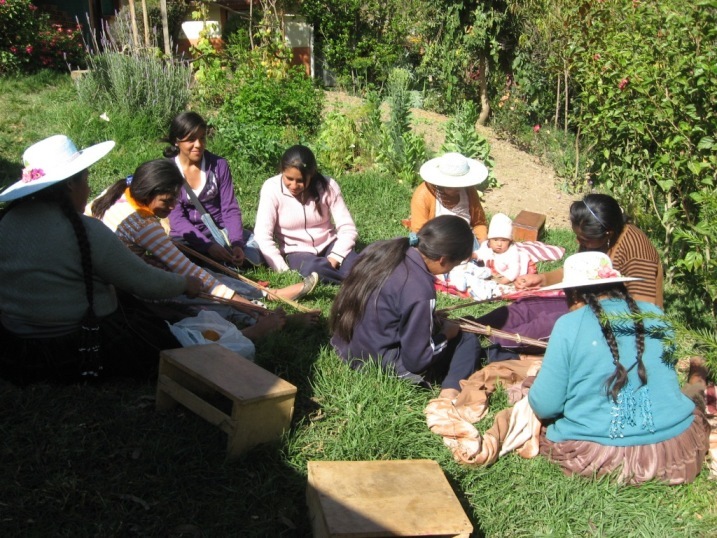 This photo is from the PAZA Bolivia blog written by Dorinda Dutcher. Maxima was a wonderful teacher. When I asked her if she enjoyed teaching she laughed and told me that when she had taught her daughters she would lose patience and want to slap them! Now she says that she is used to teaching and enjoys starting the young girls in the “Club de Chicas” in Independencia on their first weavings. I have made a tentative date to visit her in Independencia next March during the peach season. I gave her a couple of key fobs, one of which was in double weave and I think she would like me to teach her that when I visit. I was surprised as there were double weave belts on sale in her stall but she told me that they had been made by other weavers. I have come across this before…weavers learn what their mothers and grandmothers can teach them but are unwilling to ask non-related weavers and their weaving peers to teach them other techniques. Back at home I wanted to put things I learned into practice but I started off slowly by simply using one of the new designs I had learned in a cell phone pouch. I have made many cell phone pouches and realized that not one of them has been made with a pebble weave design which is, after all, my favorite technique. Here is my latest cell phone pouch with the new design. You can see it on the pink bordered huato. I wove and sewed a red tubular edging and used a snap closure. I know that we like to apply nice names to these motifs but, of all the designs that Maxima taught me over the three days, only one had a name, the aforementioned linquito and she had no name for pebble weave either to distinguish it from the other weaving techniques practiced in the area. Here is the cell phone pouch on my other finished project for this week - the shadow weave piece. The shadow weave piece also came off the loom this week. You might remember that I had only wound a one-yard warp as it was an experiment. I am ridiculously pleased with it! However, no matter how I tried to photograph it I couldn’t get the shadowy three-dimensional effect to show up so, here it is looking rather flat. Here is the warp on my backstrap loom with its bamboo reed, three sets of string heddles and shed rod and on the right you can see it in progress. On the left you can see it as it came off the loom and on the right after having been wet finished. The two doubled black edge ends I used looked a lot better after wet finishing but I am still not sure if doing that was such a good idea. Now, what do I use this piece of cloth for? I am actually thinking of using it as the lining for a bag…would that be nuts? I LOVED making this! I have another four-shaft draft that I might tackle and then there is the eight-shaft one that has been calling to me for some time now…do I dare? We are less than two weeks away from the start of our Ravelry group weave-along and I found some wonderfully inspiring pictures today from the Education and More site. Kareanni who works as a volunteer for this organization is in our backstrap group on Ravelry. 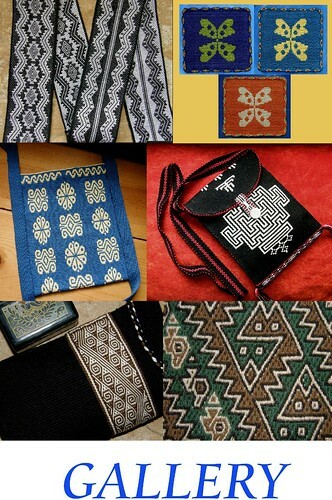 These bags are just a few of the latest fair trade products from Guatemalan weavers being offered by Education and More and are wonderful inspiration for our weave- along which will be all about using color and stripes in plain-weave. I have had a wonderful array of completed backstrap projects coming into my inbox as well as posted in the Ravelry group this week. Where do I start? 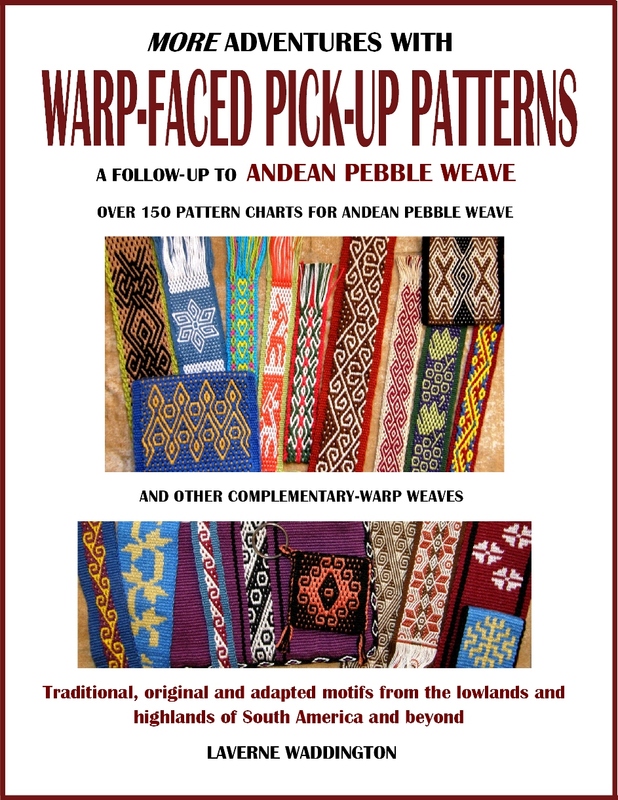 Andreas in Greece emailed me telling me that he has been weaving from the tutorials on this blog and from my Andean Pebble Weave book. Not only has he picked up the pebble weave technique, but he has also gone on to make his own terrific designs. 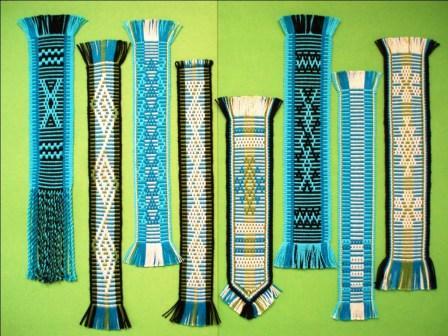 And here are his simple warp float pieces…beautiful!! You will recognize some of these designs from my tutorial while others were designed by Andreas. I do hope that we keep in touch as it would be great to learn about traditional weaving in Greece. Andreas told me that there is no warp-faced tradition. How in the world did he shape the bottom of that center band?? That is so cool! 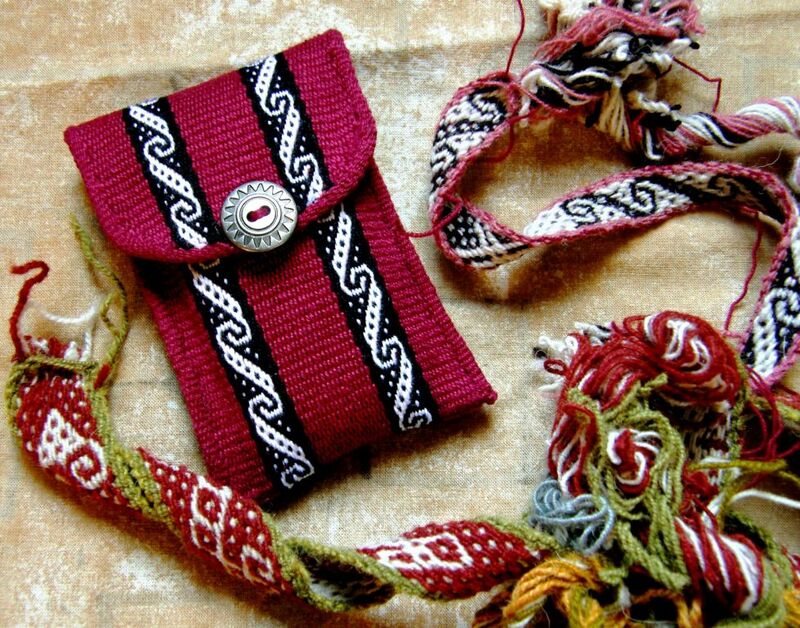 Amber aka lavitaaj on Ravelry has been weaving outdoors making a renaissance design pouch for her sister using the “warp floats galore” technique. All that is left to add is the toggle. She has edged it with a tubular band and I love the tassels she has added. Here is what Jerome aka HeyZ has shown us in his first appearance in the group…a great combination of small pebble weave motifs and a simple and very effective warp float design of his own invention. Anne and Kateri are working their way successfully through the first lessons in pebble weave while Yonat, who wove with me in Santa Cruz California last spring, has been doing a study in simple warp float patterns with beautiful results. Speaking of simple warp floats, I received some pictures this week of the weaver who taught me this technique in coastal Ecuador. Kathleen Klumpp, who continues to work with Trinidad and her family to document the ancient spinning, dyeing and weaving techniques used in the coastal region and find markets for their products, sent me these pictures of Trini’s latest work. In addition to the large satchel-like shoulder bags that Trini has been making she is now producing these cute purses using tagua nut buttons as closures. You can see her on the right weaving and sewing the edging band to the finished textile using her mother's handmade rigid heddle. I would so love to have Maxima see this way of making the "bordes"! To finish, I would like to make an appeal on behalf of Dorinda, Maxima, Zoraida and little Zuni and the weavers of the Independencia area in Bolivia. The PAZA project is currently experiencing a funding crisis. Sales at the fair last weekend were disappointingly low. I would love for you to visit the PAZA site and see for yourselves that this is a project worthy of support. Even the smallest donation will be very much appreciated. If you have used any of the tutorials here on my blog and enjoyed reading my posts, remember that all the information I am providing comes via weavers like Maxima and Trinidad and this is one small way that we can all give back a little. Donated a small bit. Thanks for sharing everything! It’s so cool that folks all around the world are learning pebbleweave and backstrap weaving through your efforts. I love the designs Andreas came up with! Oh! And your shadow weave is gorgeous!!! Thanks Jennifer. It really was fun to weave something like this for a change of pace. You are welcome Jennifer and I am sure that Dorinda will be very grateful. She lives out in the country and although there is an internet cafe in the town, it rarely opens and so she may not yet know about your donation. When I need to contact her I have to wait up to two weeks for a reply. I hope that Andreas keeps in touch. His work is great and I want to know how he finished that band! Well here is what i did. I weaved the end of the band by excluding in each row some warp threads from both sides and then i twined the pending warps of the border along the sloped sides. Thank you Andreas for telling us about this technique.It is a wonderful finish and I can’t wait to try it. Laverne, I have saved the link to the Paza site so that I can make a contribution next paycheck…having just ordered from Education and More Fair Trade website, I’ll have to wait a bit. I am more than happy to help as I can in gratitude for all you have shared and taught us from these wonderful people. I so enjoy “meeting” them through you. 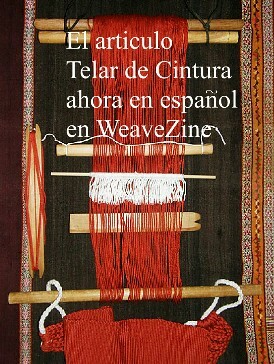 I hope you will show the Guatemalan weavings you bought from Education and More when you get them. They are bound to be gorgeous! The three sets of string heddles on my shadow weave piece may look intimidating but remember that this is a balanced weave and so raising the heddles and opening the sheds is relatively easy compared to opening one on a warp faced piece with fine or sticky threads. There is enough space between the warps in the shadow weave to allow me to quite easily open the sheds although I do need to check for any rogue warps that come up by mistake. there are three of four unwanted skips in my piece from when I got a bit careless! Hello Laverne – As always your blog is a joy to read and the finished products are inspiring! Thank you for sharing the wonderful work that Dona Maxima and Dorinda are doing in Indepencia, Dorinda is such a lovely person and so devoted to supporting the weavers and dyers in the Bolivian Highlands. By the way I was definitely able to see the three dimensional effects of your shadow weave piece, it is wonderful. Thank you Lyn for your nice comments and support! 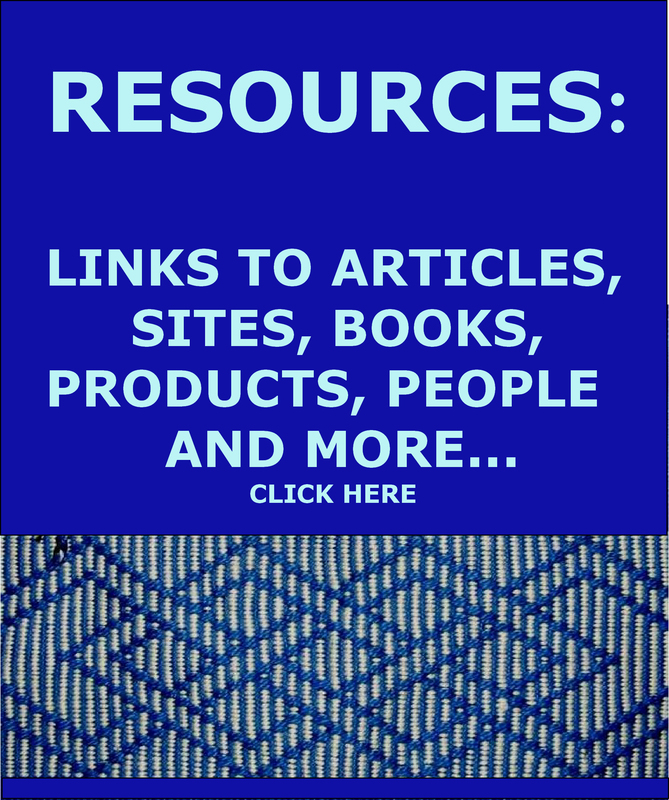 1) The Paza site seems to be closed down now – a shame, because I have been reading your old blog posts for information on backstrap weaving and felt a contribution to a group that so inspired you would be appropriate. Is there a new link to this group? Or another you recommend instead? Dorinda has started a new site and here is the address. Thanks for asking and I appreciate your idea of making a contribution to her work…that would be wonderful. As for the warpng, I am not sure what kinds of problems you have been experiencing and I hope you find a way. I have only seen one weaver in India (and that was online) sitting in the “loom” and warping but she had the aid of another woman to pass the balls of yarn around the far beam. As you must know, consistent tension is the goal and I hope that you can achieve that. Let me know how you go!